More than 1,000 Germans formed a “flash mob” Saturday in response to a leading rabbi advising Jews to keep a low profile. More than 1,000 Germans Jews and non-Jews formed a “flash mob” Saturday in response to a leading rabbi advising Jews to keep a low profile and not wear the head covering that singles out Jews. Following two serious anti-Semitic attacks against Jews, the director of the Potsdam Rabbinical College offered the advice, which sparked other Jews to carry out an opposite response. 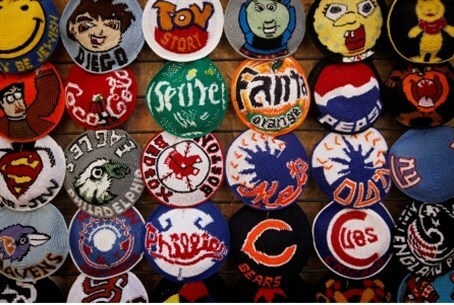 A Facebook campaign urging a “Kippa Flash Mob” drew hundreds of responses. At a synagogue Friday night, with policemen standing guard outside, Rabbi Yitzchak Ehrenberg told his congregation, “I am an Israeli, without fear. I have been in Berlin for 16 years and was in Munich seven years ago. I ride the subway and I wear a kippa. I have never been threatened or attacked,” he was reported as saying by the Welt Online website. The following day, Jews and non-Jews, including public personalities, marched together with a kippa on every head. Anti-Semitism raised its ugly head last when Berlin Rabbi David Alter was attacked in the presence of his six-year-old daughter. A man approached and asked if he was Jewish, and then broke the rabbi’s cheekbone, prompting the Potsdam official to discourage Jews from attracting public attention by wearing a kippa. The BL News from Berlin newspaper displayed the headline “Berlin is Wearing a Kippa” and showed pictures of many prominent Berliners wearing a kippa. Many of the ‘flash mob” were Christians and Muslims. Two weeks ago, a “kippa march” was staged in Malmo, Sweden, where hate crimes against Jews have been carried out, mostly by the growing Muslim immigrant community. Sweden's European Union Minister Birgitta Ohlsson joined local Jewish leaders in the rally, which drew several hundred Jews and supporters.